“I look back now,” says Shuggie Otis, “and I think, ‘Wow. I must have a lot of patience!’” The multi-instrumentalist is reflecting on the curious arc of his career so far: his fame began in earnest when he was a young teen, continued into his early twenties, and ended abruptly after the relative commercial failure of his 1974 LP Inspiration Information (now regarded as a classic) when he was dropped by his record label. Otis largely disappeared from public sight after that, and didn’t resurface for almost forty years. These days, he’s working on a new studio album – Live in Williamsburg was released last year – and engaging in an ambitious touring schedule. Otis was born in Los Angeles, the son of famed bandleader and r&b legend Johnny Otis. The senior Otis (born Ioannis Alexandres Veliotes) is commonly referred to as the “Godfather of Rhythm and Blues.” Of Greek heritage, Johnny lived among – and lived as – an African American. He co-wrote “Hound Dog” and was an influential part of the American music scene, especially in the 1940s and 1950s. Around that time the now-fifteen year old was “discovered” by Al Kooper and showcased on Kooper Session: Al Kooper Introduces Shuggie Otis; B.B. King called Shuggie his “favorite new guitarist” and Shuggie played bass guitar on Frank Zappa‘s Hot Rats cut “Peaches en Regalia.” Shuggie’s first true solo album, Here Comes Shuggie Otis, was released in 1970. While the superb “psychedelic soul” album featured many of the elder Otis’ bandmates (Wilton Felder, Stix Hooper, Al McKibbon), it was also notable for Shuggie’s multi-instrumental prowess on guitar, piano, harpsichord and celesta. Freedom Flight followed in 1971, with Shuggie taking a greater role in the album’s development. Playing even more instruments and composing most of the songs, Shuggie penned the classic “Strawberry Letter #23,” which would reach #1 on the 1977 soul charts in a cover version by The Brothers Johnson. But it would be three more years before Shuggie delivered Freedom Flight‘s followup to his record label. The simmering Inspiration Information was very different from Shuggie’s earlier work. Now just 21, Otis had recorded the album almost completely on his own (save for session players on strings and horns). The muted, intimate-sounding Inspiration Information featured extensive use of the Rhythm King, an early electronic drum machine, in place of “real” percussion. Well ahead of its time – and not, thought the execs at Epic Records, delivered on time – the album was poorly promoted, and was a commercial disappointment. The label summarily dropped Otis, and the 21 year old was now without a record deal. 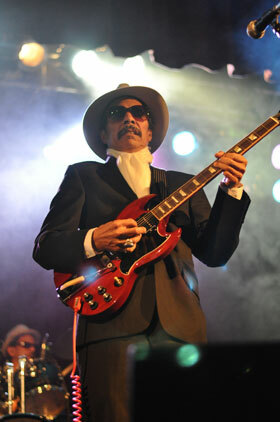 To the public at large, it was as if Shuggie Otis had vanished. Meanwhile, his songs were sampled by OutKast, Beyoncé, J Dilla, Digable Planets, Kanye West and others. But none of those people, it seemed, were in a position to offer Shuggie that elusive record deal. Shuggie Otis continued to record and perform, all as he searched without success for a new recording contract. A 2013 Sony Music collection of the best of his material from the post-Inspiration Information era was compiled and released as Wings of Love, packaged with a reissue of the ’74 album. 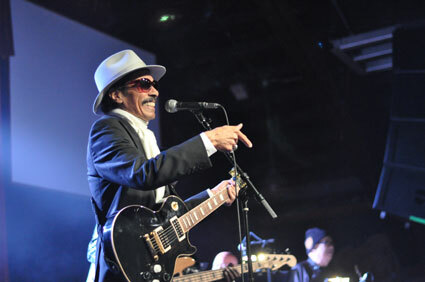 That reissue sparked renewed interest in Otis’ music, and to promote the 2013 reissue/compilation, Shuggie Otis put together a band and toured, playing for audiences he hadn’t faced in years. A contract with Cleopatra Records followed, and the 2014 Live in Willamsburg disc documented the high-energy stage show, a set list that contained old favorites and newer material. At the start of the current leg of what’s billed as The Never Ending World Tour, I spoke with Shuggie Otis about the past, the present, and the future. Over the next three days, I’ll present that conversation.